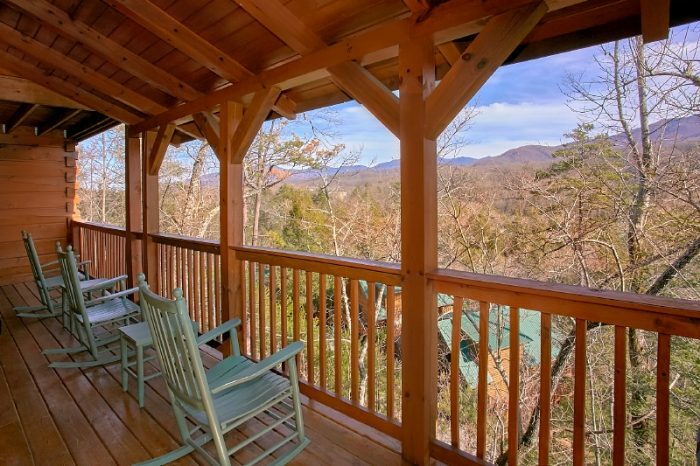 Looking for a Gatlinburg cabin with a great location and gorgeous mountain vistas? 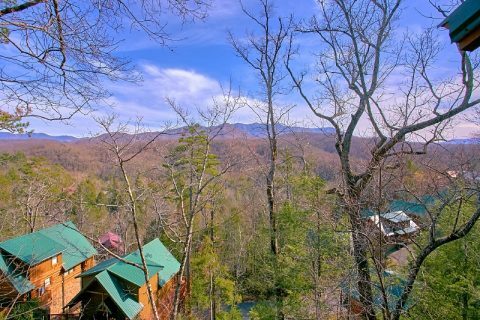 Check out "Gatlinburg Views!" 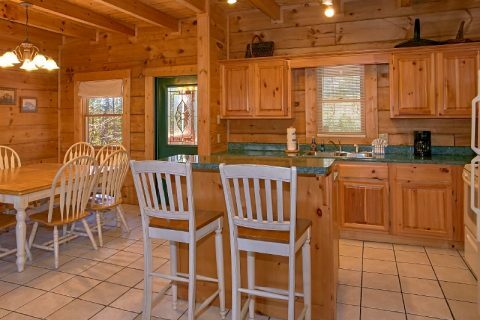 This luxury, 3-bedroom cabin is located in a prime spot only an 8-minute drive from the heart of Gatlinburg. 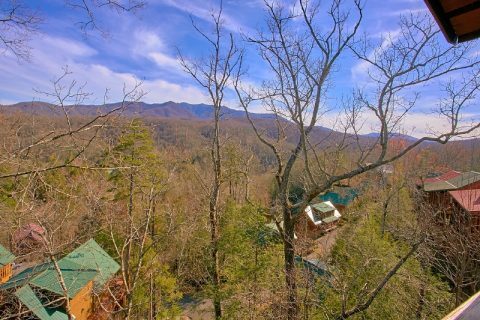 As a result, all of the natural wonders of the Great Smoky Mountains National Park, Ripley's Aquarium of the Smokies, and tons of great shops and restaurants are only a short trip away! Better yet, this rental enjoys a beautiful spot in East Parkway area of Gatlinburg. This peaceful part of Gatlinburg features views of tall mountain peaks, the historic Glades arts and crafts district, and less visited parts of the national park like the Greenbrier Picnic Area. 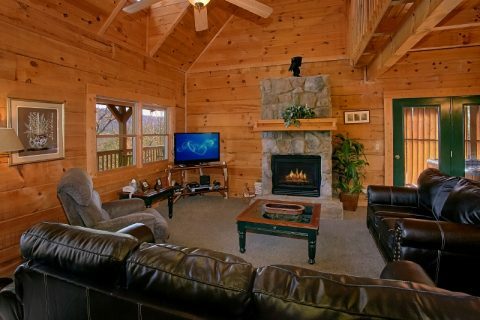 Step into the cozy main level of your cabin to enjoy the living room complete with a gas fireplace, 52" HDTV, and comfortable leather furnishings. 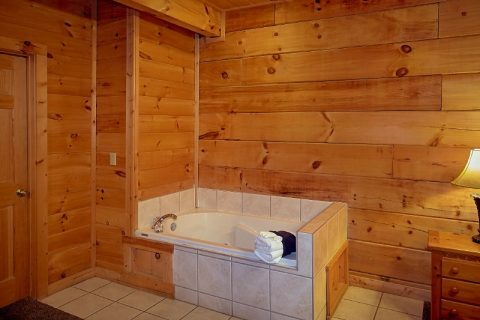 From here, you can step out to your cabin's deck to enjoy the crisp mountain air from a rocking chair or the hot tub. 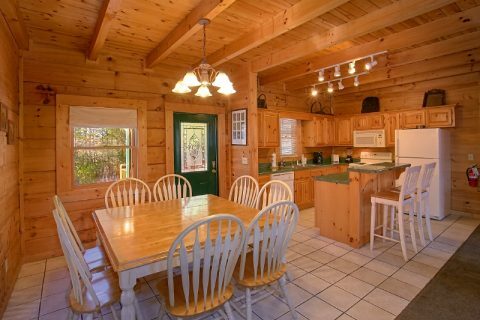 This level is also home to a fully-equipped kitchen and a dining table for enjoying delicious dinners with your friends and family. 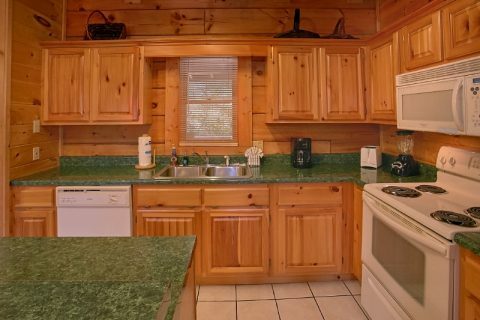 Additionally, your cabin also features a gas grill for enjoying a cookout in the great outdoors. 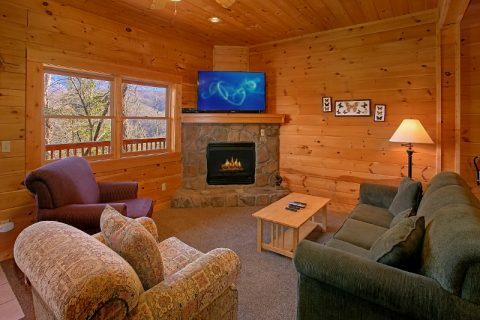 After dinner, everyone can go downstairs to enjoy a fun movie in your cabin's theater room complete with surround-sound and a 62" HDTV screen. 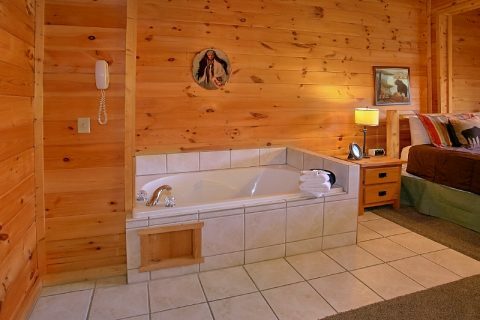 This level also comes with a wet bar, microwave, and mini-fridge for eating tasty snacks during your movie night. 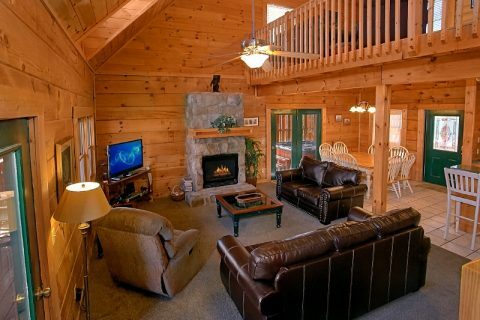 A fireplace on the lower level ensures that the theater area is warm and welcoming during the cool winter months. 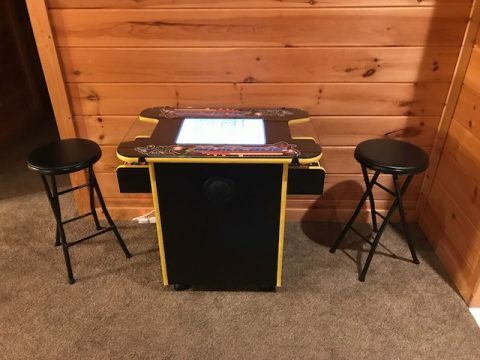 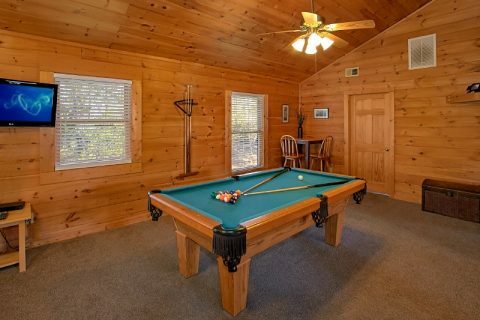 When the kids need a place to play, there's also a nice game room upstairs that features an arcade game and a pool table. 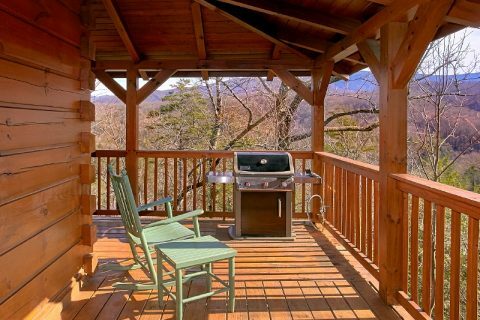 Both of these levels offer access to a deck that's perfect for enjoying your cabin's lovely mountain view. 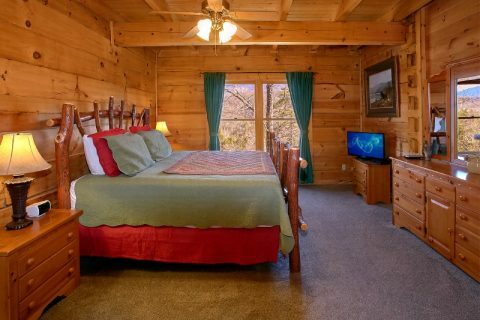 After a great day in Gatlinburg or the Great Smoky Mountains National Park, you'll want to be well-rested before your next day in the Smokies! 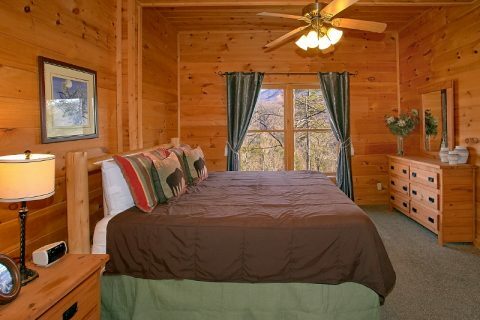 Altogether, this cabin comes complete with 3 private bedrooms. 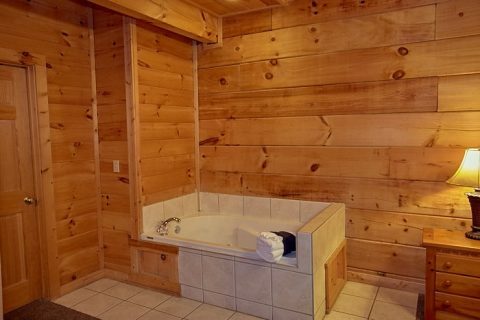 The main floor and the lower level each feature a king bedroom with a jacuzzi, private television, and a full bath. 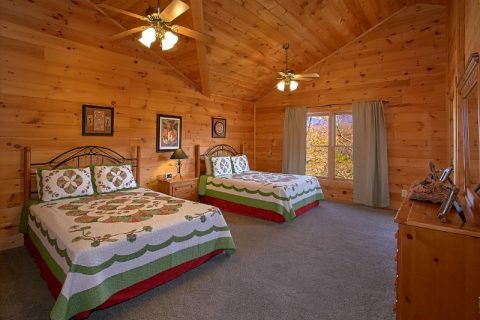 The upstairs bedroom provides two queen-size beds and another full bathroom. 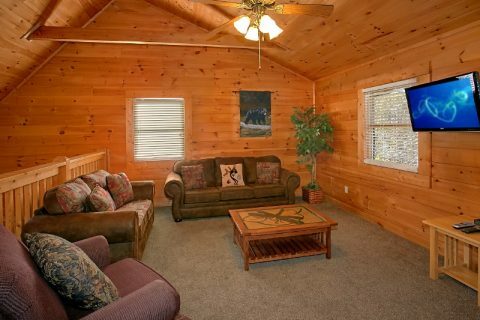 This rental also comes with 2 sleeper sofas for accommodating extra guests. 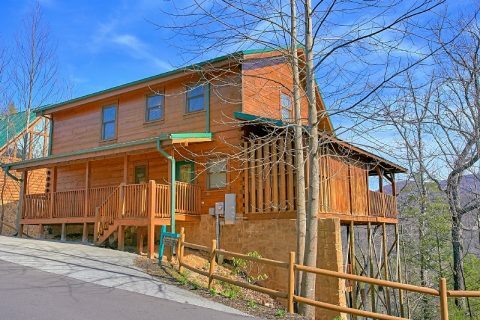 With room for up to 12 people, this luxury cabin in Gatlinburg is the perfect place for your family and friends to getaway to the Smokies in comfort! 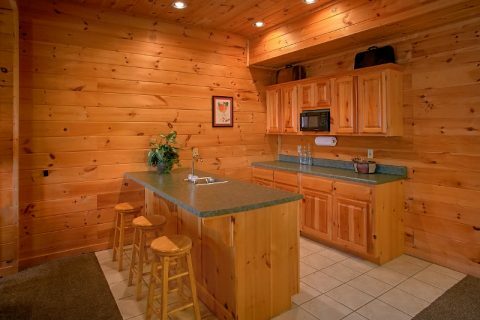 Book "Gatlinburg Views" with Cabins USA Gatlinburg today to save 15% on your nightly rate!